Towering at 18,586ft/5665m, Mount Elbrus is revered as the highest peak in Europe. We are heading back to one of our favorite places, the Caucasus Mountains in the south of Russia with a great challenge in mind, to conquer this peak and one of the famed Seven Summits. 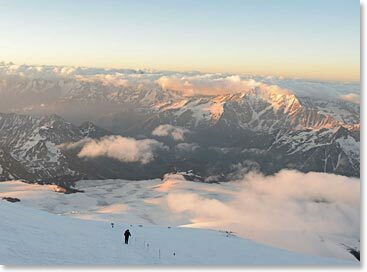 Climbing Mount Elbrus will not be our only objective. We will begin this adventure in the celebrated city of St. Petersburg and continue onto Moscow to explore the enriching culture of this great country before we embark on our climb. From the long, beautiful “White Nights” in St. Petersburg to the active spirit of the Caucasus region our seven climbers from Canada, the United States and Sweden are sure to experience a great adventure! Follow along as we send updates from Russia. July 8, 2014 – The Whole Team Stands on the Summit of Mount Elbrus! July 5, 2014 – It Snowed All Night! July 2, 2014 – We Are in the Mountains Now! June 29, 2014 – XXV International Marathon "ERGO White Nights"